Note: When I wrote this, I was sure I knew how I broke the engine. Now I have no idea. My friend Val pointed out that a lean condition shouldn’t cause rod bearing damage, but rather head damage. It’s also possible that RTV clogged an oil passage and starved the bearing of oil, but I can’t even say for sure that it was a rod bearing that let go because we haven’t tore the engine down yet. Be sure to follow us on Facebook for updates. 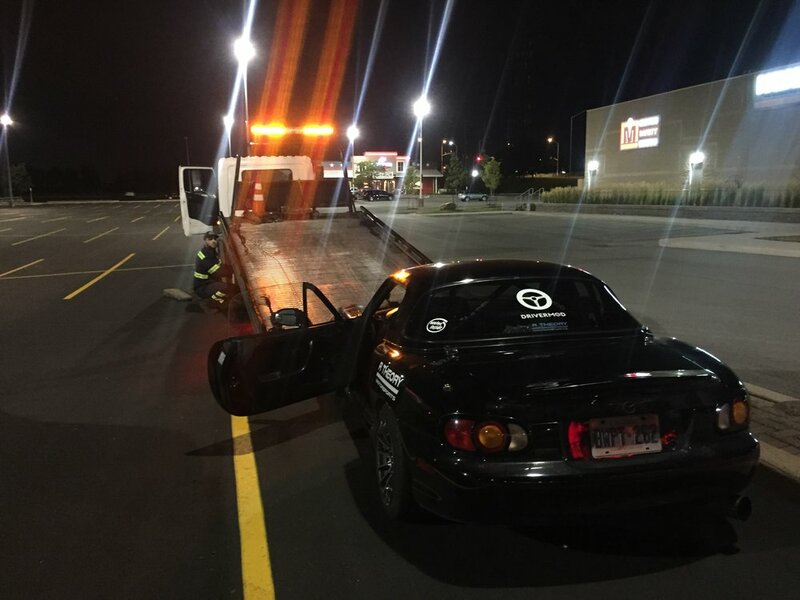 Our Ecotec Miata went through a beating at this year’s Gridlife Midwest festival: we blew a brake line, broke some sensors, had a wack-load of electrical issues, my header fell apart; and just when we thought we were home free, a speedometer failure. We thought that was all behind us. I fixed the harness, got the header welded together, fixed the speedometer, hell I even refreshed the brakes with new rotors and a set of Hawk DTC-30 track pads. 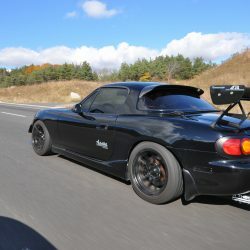 That’s all to say that when I rolled up to the Toronto Motorsports Park for a night of lapping, I was ready. 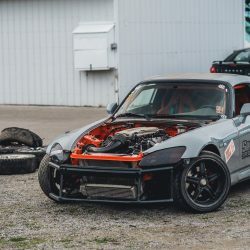 The event was hosted by BMW True North, and you could tell – the paddock was littered with everything from humble 328is to raunchy-sounding M3s. 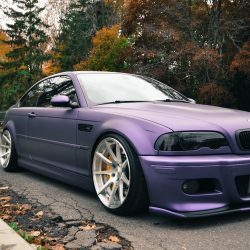 With my non-car-person-friend Mike in tow, we emptied the car of tools and anything else that could turn into a projectile mid-corner, and set out to chase BMWs. Thanks to Rajan Thiru for these pics. And the car was great. 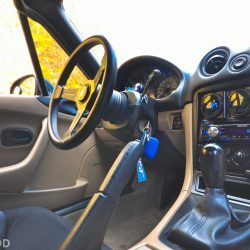 It’s a Miata on sticky tires, quality suspension, and an extra 70ish wheel-horsepower; of course it was great. It was sharp and eager, neutral with a slight tendency towards oversteer. That’s what happens when you build your car; you can hone and sharpen every aspect of it so that it just right for you and nobody else. The flip-side of building your own car is that you’re bound to make mistakes. The reality of those mistakes came crashing down during my second session out. A minute into my first lap of the session, a high-pitched mechanical howl rang out. It was shrill, rhythmic, like a piston airplane was taking off next to my head. I pulled off the track, shut down the car and the sound stopped. I started looking around for obvious things: a broken serpentine belt, an exhaust rattle, something minor. When I started the engine back up it became obvious that the sound was resonating from the engine. At that point, we did the only thing we could do, tried to drive home. I stayed in the right lane and kept revs low, but eventually my luck ran out. The engine started producing a loud banging sound and we couldn’t maintain speed, eventually ending up in the breakdown lane on the side of Highway 403. I got it started again and this time we made it to an off ramp before the car died. With traffic piled up behind us, Mike hopped out and heaved on the back of the car. Mercifully, the stretch of road was downhill and ended in a plaza with a Canadian Tire and restaurants. We parked the car, grabbed food while waiting for CAA to show up, and called it a night. 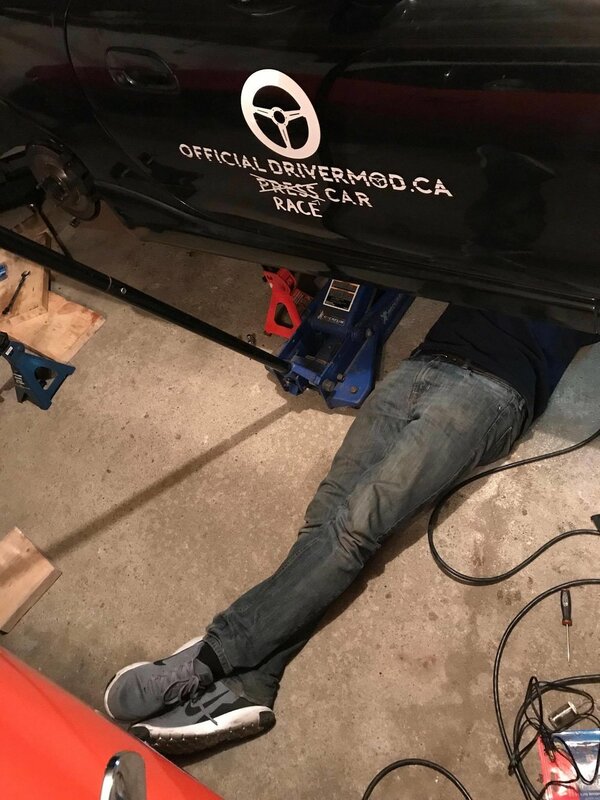 The only picture taken that night – fixing the speed sensor. So what happened? Rewind to the night before when our web developer Mike and I were doing some minor work on the car in his garage. That included installing a water temperature sensor, which involved removing the intake manifold. It was getting late, maybe one or two o’clock in the morning, and I started the car to head home but it was acting funny. Idle RPMs fluctuated between 800 and 1200 rpm and it was lean. We took the intake apart twice over and noticed nothing wrong. I had a headache, it was late, so I drove it home. I got up early the next morning and start taking things apart once more in my condo’s parking garage, and somehow, the night before I failed to notice that the rubber intake manifold gasket for cylinder #1 was missing. Relieved to have found the issue, I hopped in my girlfriend’s car, retrieved the gasket from the floor of Mike’s garage, put the car back together and went straight to the track. I can only imagine that it was the 38.1 km drive home the night before with one cylinder running extraordinarily lean, (the result of it breathing unmetered air) that shredded cylinder one’s rod bearing, leading to rod knock, and subsequently leaving me stranded on the side of the road that night. Truthfully, this has sort of been the running theme of this build. We made a lot of mistakes. 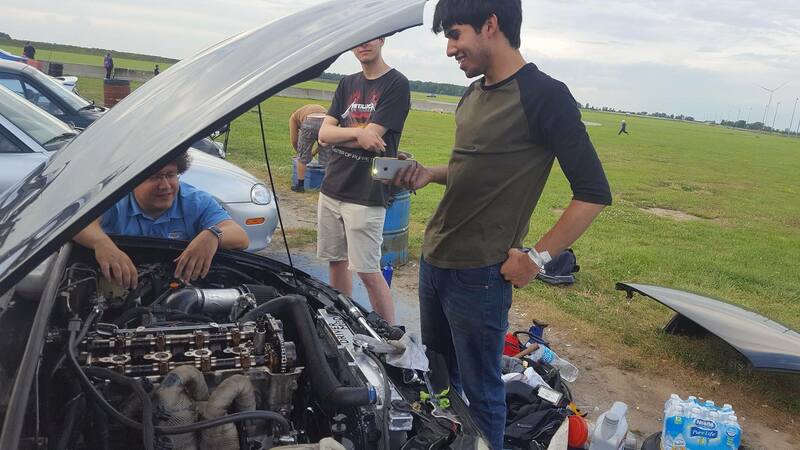 We failed to seal the oil pan correctly the first time, we destroyed the original transmission during the car’s maiden voyage, a badly routed wiring harness ended up melting causing sensor issues, and our header fell apart on us three times. Maybe a chance to start over, and do everything right the first time, isn’t so bad. And that starts with a new motor. I’ve placed an order for a 2006 Chevrolet HHR 2.4l engine with 47,000 km on it. Not only is that 120,000 km less mileage than my old engine, but 2006-2007 engines came with forged internals – my 2008 engine did not. Replacing an engine is never fun, but by this point I know the car like the back of my hand, and this time, we’ll do it right.